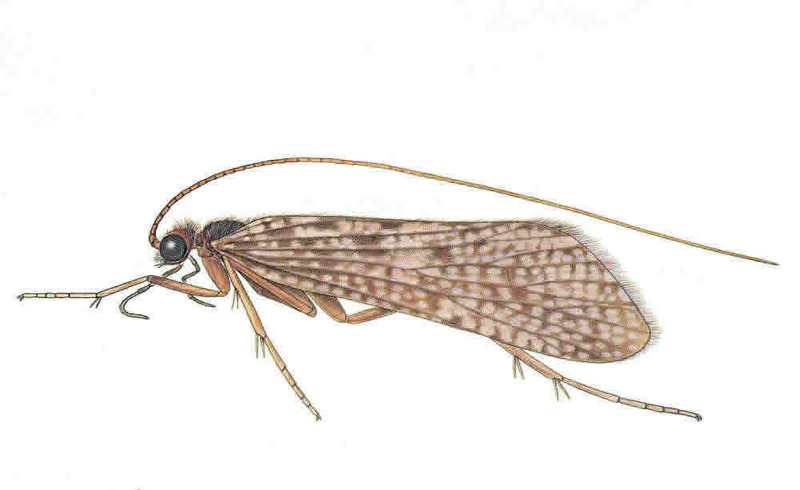 If you are a caddisfly, you go through complete metamorphosis - larva, pupua, and adult. Your average life span is just one year. That's assuming that you make it out of the larval stage without being gobbled up by a hungry fish. Caddis hatch from eggs to become sort of a wormish-like larva. Once in the larval stage, they must find cover fast because they are solid protein and fish love them. You should fish the artificial caddis larva about the same as a nymph - dead drift the fly down at the depth at which the fish are feeding and prepare yourself. The pupal stage begins about six months to a year after it is hatched. During this stage an adult body will form inside the pupa. When ready, the adult emerges out of its covering beginning the final stage of adulthood. The emerging adult produces a gas bubble that floats it to the surface. As it ascends, the shell expands and bursts, and the adult pops out of the water. Then they will test their wings which in turn attracts nearby fish to strike. Check your fly box for the best match to the hatch and fish your bug like an emerging adult. Make your fake appear as though it is rising to the surface, about to take off. Cast your fly upstream, allow it to dead drift to the fish (don't forget to mend your line), and just before it arrives, lift your rod and fly line to raise the fly. Vary the speed of the lift and wait for the strike. Caddisfly strikes can be amazingly violent.